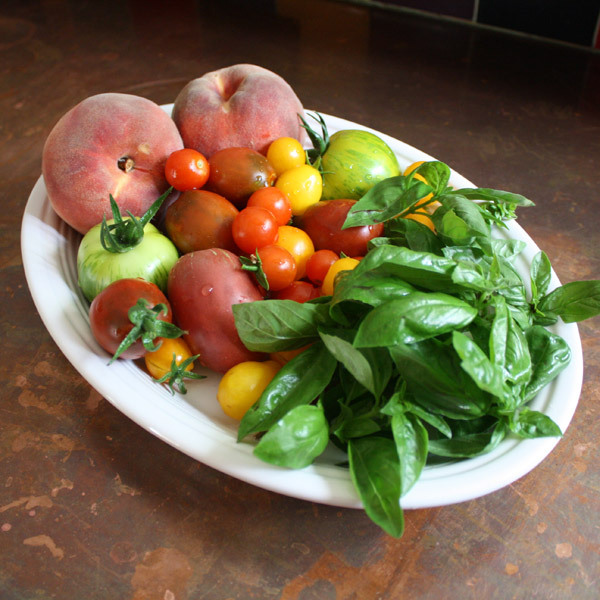 Summer is upon us, and our gardens are starting to reward us for making it through yet another long winter of tasteless store bought fruits and veggies. Pea pods are starting to plump, holding sweet little round orbs of love. Tomato and pepper plants are starting to grow excitedly from little baby seedlings into botanical toddlers. Strawberries and raspberries are ripening at a mad pace–we’d even have cherries this year if the giant dog would do anything about the thieving squirrels! The hubby came in with a big beautiful bowl of strawberries from the garden tonight, so – obviously – daiquiris are in order! Nothing says summer like an ice cold beverage, and I love celebrating the garden by drinking it. This recipe is kind of a daiquiri/mojito hybrid (even better! ), nothing like the syrupy pink slushee drinks served at bad chain restaurants across the country. 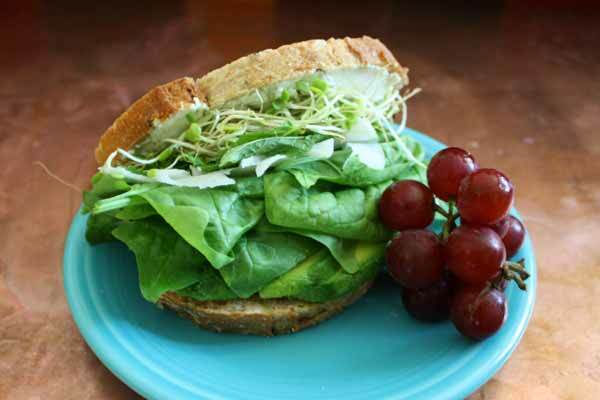 Think Outside of the Bread Box: No More Boring Sandwiches! My world doesn’t abide by standard 9 to 5 rules. I run a small business, work as a freelance graphic artist, and have a large crazy dog who needs more supervision and attention than a 9 to 5 family could provide. (Boy did he luck out finding suckers like us!) 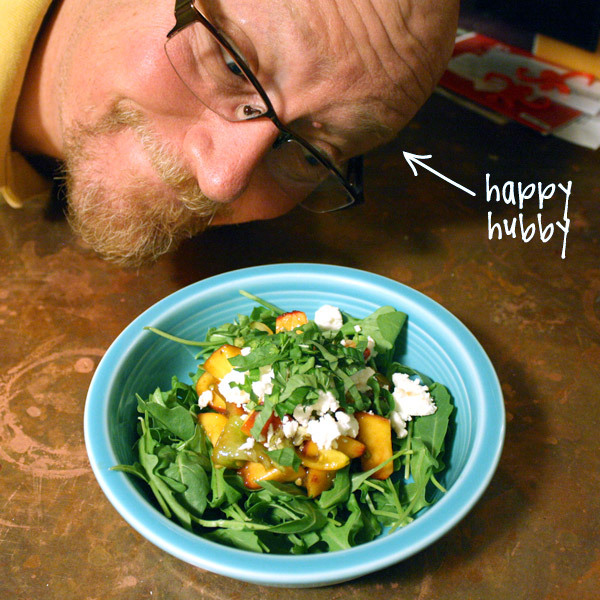 In addition, the Hubby works four nights a week, so much of our quality time happens in the afternoon. Rather than having a nice dinner out once a week, which seems to be the American norm, we tend to do lunch out instead. For us, eating lunch out is actually quite nice. Unlike 9to5ers, we are generally not in a hurry during lunch. We aren’t running out between phone conferences, grabbing the fastest thing on the block. We don’t have business meetings over lunch–there are no laptops and no sales pitches. Instead, we have the luxury to take our time and read the paper, maybe do the crossword puzzle. Our tabs tend to be pretty low, since we aren’t tempted by the wine list, and since lunch is served in smaller portions, it’s cheaper. Often we spend less on lunch out than we would have spent buying lunch fixings at the grocery store. It’s also a great way to try that trendy new spot you have been curious about, or that crazy ethnic restaurant with the menu you can’t pronounce (the one you are a little afraid of, but still intrigued by) without blowing a lot of money or time on dinner. I am a big fan of lunch. It’s National Cheese Fondue Day! There’s nothing quite like a big pot of gooey, warm, melty cheese. It’s not the healthiest thing you can eat, but one must indulge once in a while. Cheese just so happens to be my absolute favorite thing to eat ever. Too bad I can’t figure out how to grow it in the garden. * Also called Kirschwasser, a liquor made from a particular kind of German sour cherry. Available in most liquor stores–a pint will last many many fondue nights. Warm your fondue pot to low heat. You could also use a heavy ceramic bowl warmed in the oven, or place the pan over a warmed hot plate after cooking. Toss the cheese with the cornstarch and nutmeg in a bowl until cheese is thoroughly coated. Place the pan over medium heat on the stove, and add the wine and the Kirsch. Bring to a slow boil. 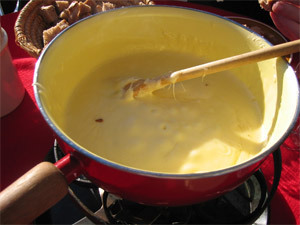 Carefully pour into your fondue pot on low heat—keep an eye on it and stir occasionally so it does not scorch on the bottom. The Hubby has a smoker–one of those big ugly black cylindrical barrel-looking grills. He is a master at pulled pork and beer can chicken. He has smoked turkeys for Thanksgiving, and they have been divine. 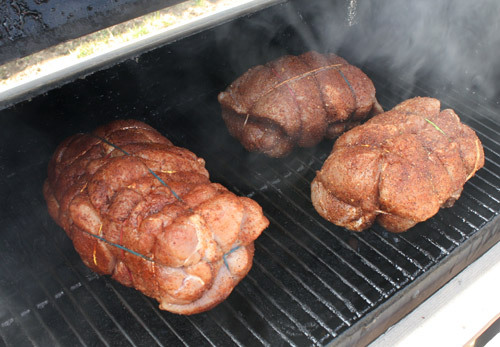 This past year for Turkey Day, we decided to try our hand at making ham, and it was amazing! You have never seen meat devoured so quickly! 10 pounds was gone in a matter of minutes. So naturally, when Easter rolled around this year, and we found out we’d be having family in town, we got excited to recreate that delectable dish. OK, admittedly not the prettiest carrots you've ever seen, but they will make great soup! 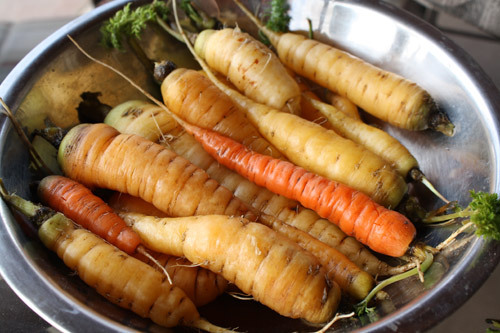 These carrots had, indeed, frozen and thawed, frozen and thawed, frozen and thawed, over and over throughout the winter. As a result, the skinny ones were flimsy, and the large ones were very woody in the middle. I couldn’t possibly chop them up to put on a salad, but they had too much life left to be doomed to the compost bin. The solution? Soup! Soups and stews are always a great way to take advantage of veggies that aren’t bad, but aren’t quite at their freshest, either.